This was not what I had planned having for dinner, Thursday, but I had not made Giada's Fried Mashed Potatoes which had left me, in the mood, for potatoes. 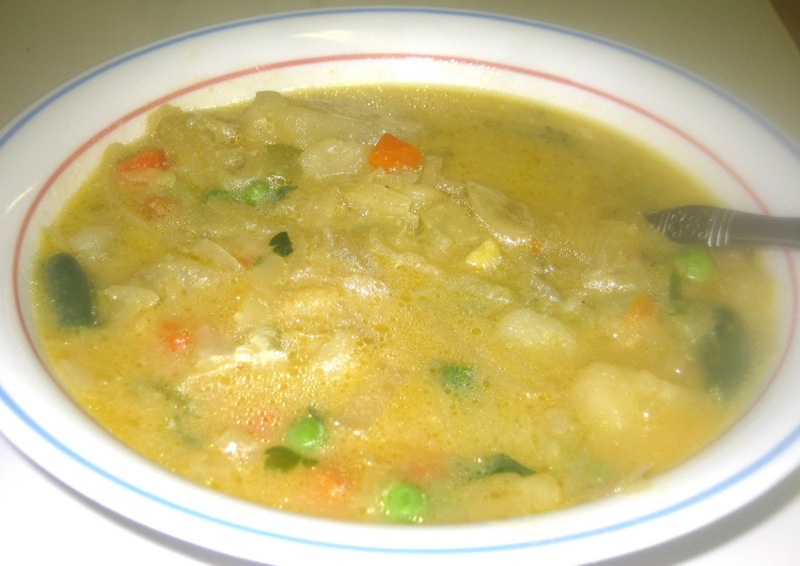 I was also in a hurry and I find soup very quick and easy to make with a shortcut or two. In a microwave, on high, cook potatoes with skins, washed thoroughly, for 5 - 10 minutes, depending on the power of your microwave. I used small to medium potatoes and took the smaller ones out, earlier. As soon as they start getting pliable, they are ready to be peeled. If you like a softer potato or plan to blend the soup to a smooth consistency, boil the peeled potatoes, cut into chunks. In olive oil, in a 4 quart sauce pan, cook potatoes carrots, celery, chopped onions, and cabbage. Mix together and cook until all vegetables are soft. Add vegetable broth and season with parsley and pepper. If you desire a thinner type of soup you may want to add 1/2 cup of water. Heat soup through, stirring occasionally, and serve.